Tomorrow’s tool, today’s imagination’ is a catchphrase in the arena of science. The utmost development of science made our life much smoother than before. Basically, these are nothing but the implemented forms of the dreams of some ingenious people. The devisers dream to build tomorrow’s world. They work relentlessly to address various social problems in different ways, and they not only find solutions but also come up with innovative tools. 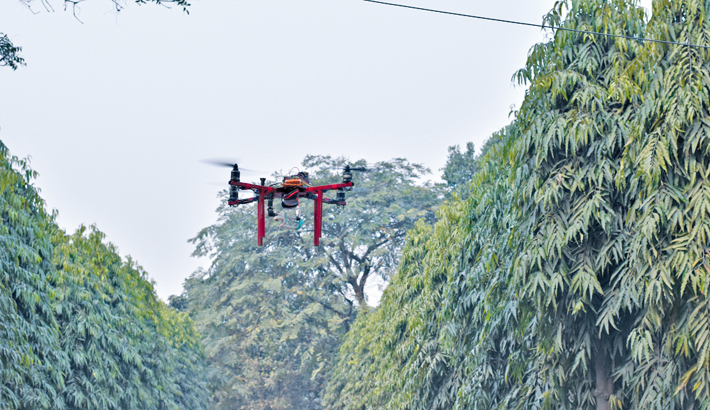 In the continuity, some young devisers of Bangladesh accrued on the Jahangirnagar University campus to display their dream devices and plans in a science festival organised by the university science club (JUSC). “We have developed a project on locking system in public place. Lose of purse and other valuables from public place is a common phenomenon in Bangladesh. Our digital public locker will secure your belongings perfectly and it will be cost-effective,” said Shahriar Himel, a first-year student of Jahangirnagar University. Piyus Kanti Partha, a student of Hamdard College, developed a programme for blind people, so that, they can enjoy internet browsing facility and be connected with the world. His device can be perceived as the voice command, physical movement, and thinking of blind people. In total, 71 such innovative projects were exhibited on the 3rd JUSC National Science Festival 2019 where the young tech-savvy pupil from school, college and university level participated. The young scientists came on the Jahangirnagar University campus with their projects to showcase them on the festival and along with a dream to clinch a title of the event. Jahangirnagar University Science Club (JUSC) has been organising this Science Festival every year to groom up young talents since 2017. With the slogan ‘think scientifically, expose your ability’, the two-day long festival of this year was scheduled on February 08-09. About 1,000 students from 10 renowned universities, 10 colleges, and 32 schools across the country partook on the event with their innovative projects and scientific posters on their respective research field. The science festival was featured with a scientific poster presentation, science project showcasing, idea contest, Rubik's cube gaming competition, science quiz competition, robotics workshop, and a career guideline programme. The scientific poster presentation was only for university-level students, science project showcasing, idea contest, and science quiz competition were for school and college level students, and Rubik's cube gaming competition, robotics workshop, and career guideline programme were open for all. A team of Biotechnology and genetic engineering department of Jahangirnagar University sealed the title of scientific poster presentation. They have found a plastic eating microorganism. This microorganism will save our environment eradicating plastic bodies easily. Besides, a good number of scientific posters have been exhibited at the festival where ‘anti-malaria drug from transgenic tobacco’ is mentionable. A team of Military Institute of Science and Technology (MIST) team sealed the title of university-level project showcasing. They have brought a multifunctional robot. Jahangirnagar University and Khulna University occupied the second and third position respectively. In junior level, a team of Methodist English Medium School hauled first prize with their project 'Pyrethrin: An alternative to artificial pesticides' where the team of Monipur High School and Adamjee Cantonment Public School clinched second and third positions respectively. The team of Monipur High School secured the first position in School senior level where BPATC school and college and Morning Glory School and College secured second and third position respectively. Automatic irrigation system, Light for data transferring, and election problem solution projects are mentionable. The most devising projects were seen in College level competition. All the projects were mesmerising. Future Innovative Science Club brought a self-made drone project named 'Intelligent safety for Human being'. The drone could be used to identify the trespassers, to be helpful to stop smuggling, a different rescue operation. It also could be used to collect information from hard to reach areas. This team sealed the title of this event where Hamdard College secured the second position with a project for providing internet facilities for blind people and Notre Dame College stood the third position for arduino radar project. Meanwhile, Al Zubayer Siam, a student of Mohammadpur Govt. High School solved the Rubik’s Cube within 13 seconds and won the first prize while Mahmudul Hasan Robin of Chemistry department of Jahangirnagar University and Shikder Sams Tabriz of Mohammadpur Govt. High School occupied second and third positions respectively. The writer is a student of Chemistry department, Jahangirnagar University.